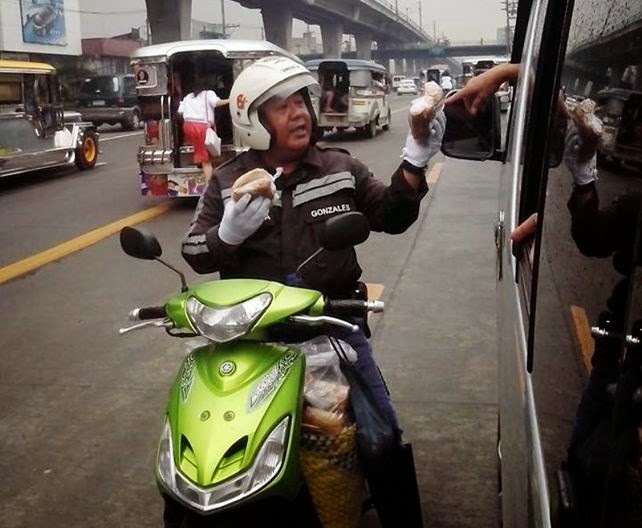 A Traffic Officer’s photo had been gathering various reactions on Facebook as the officer was seen in his uniform selling bibingka to commuters. The photo had been shared more than 7,900 times and received more than 164 thousand likes just after a day it was posted on Top Gear Philippines’ Facebook page. Posted with the caption explaining that the officer sells bibingka for his children’s tuition instead of resorting to bribing, many had reacted in different ways. As the photo cannot tell the whole story, some had thought that the officer is forcing the commuters to buy his rice cakes while some say that he should be doing his job instead of selling since they presumed the uniformed officer is on duty. According to Rose Anne Olarte Mellizo who took the photo, the officer’s family name is Gonzales. Officer Gonzales never forced the people to buy his rice cakes. He was selling his wife’s homemade delicacies to pay his kid’s school fees. Mellizo explained that she had no bad intentions in mind when she posted the photo that had been reposted by other people. She had been deeply moved by Gonzales’ efforts to make money in the legal way instead of taking bribes from the motorists. She asks other netizens to stop thinking negatively about the officer. Other netizens who said they had met the officer shared that Gonzales is very polite. Some speculated that he must be selling his bibingka during his break and after his duty thus he is still wearing his uniform. A netizen also guessed that the officer could be wearing the uniform even though he is off duty to show the people who they are buying from. Post by TOP GEAR PHILIPPINES. The photo cannot explain all and those he had deeply moved are also hoping that his business that started with good intention will not put him in any trouble. The officer works hard for his family and his story had inspired many as the will inspire more as his photo is expected to circulate more online.